The rains have begun late this year and because of this it has been a long and fruitful growing year for the front yard garden. The flowers from the squash and sungold cherry tomatoes were picked, the squash itself nurtured, all by neighbors unknown. 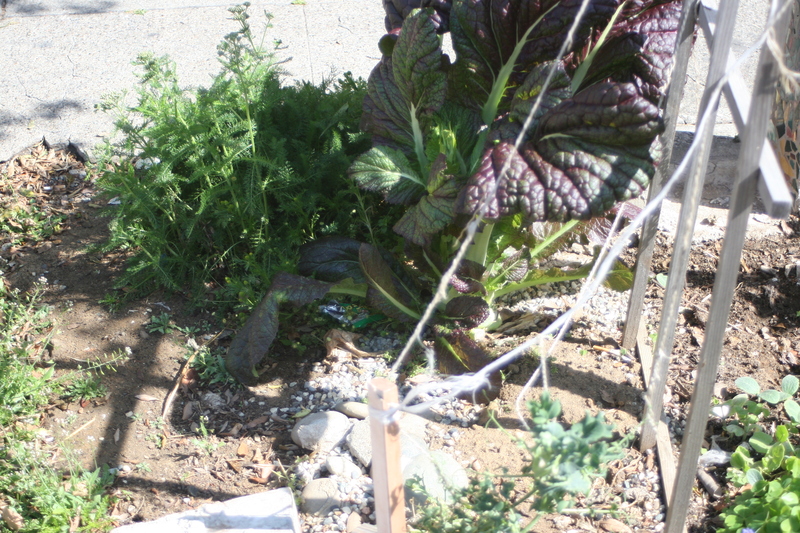 The front yard food garden is separated by a driveway that has a rose tree and other non food plants. The non food part of the garden touches my neighbors garden. I garden their plot also. My neighbors got a letter about the front yard garden. 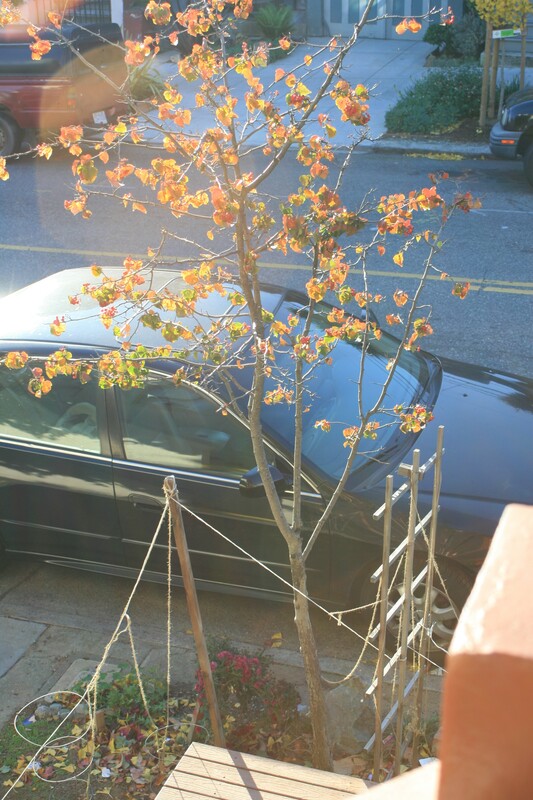 I had begged these neighbors I consider friends to be part of the city planting that was happening in the Mission District, and now they are displeased with me and the front yard garden. The letter we both got has not made them want to keep their front yard garden any more than they already did not want to have the front yard garden. Before and after getting the letters the gardens were prettied up. I plant and maintain these gardens for all of the folks that like finding free treasure, for folks with plenty and for folks with not enough. There are millions of hungry people in the U.S.A. and this garden helps me feel better about that fact. Another neighbor, a friend had told me to expect the letter. This neighbor is one of the many gardeners in the front yard garden. He was a farmer in Mexico and has given me many garden tips. He said he had tried to explain fallow soil and why it was messy. He said she did not understand. I realize many do not know that plants are alive. Plants are alive. Tagged with 2013, california, community, Food, food insecure, friends, front yard garden, hunger, Local, Mexico, Mission district, Neighborhood, neighbors, political, public, thinking, travel, U.S. The mustard has been popular, the peas need some explaining. I will be planting squash plants for the popular squash flower soon, so be watching for that. The trees are losing their leaves and changing colors. 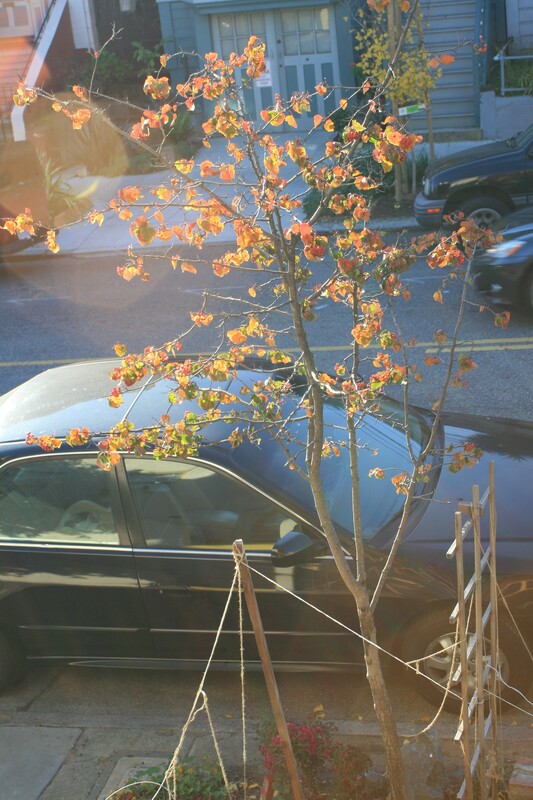 I love the changing of the season for this neighborhood tree and the newly planted ginko losing its bright yellow leaves, across the street. The mums growing low to the earth, propped up with a repurposed stake, by an unknown Urban Farmer, seem to bloom until the dark gray weather of winter arrives. Winter hasn’t arrived and it’s unseasonably and unreasonably warm weather for San Francisco, California, even for the ‘Sunny Mission’. The bench top shows and still the homemade trellis’. 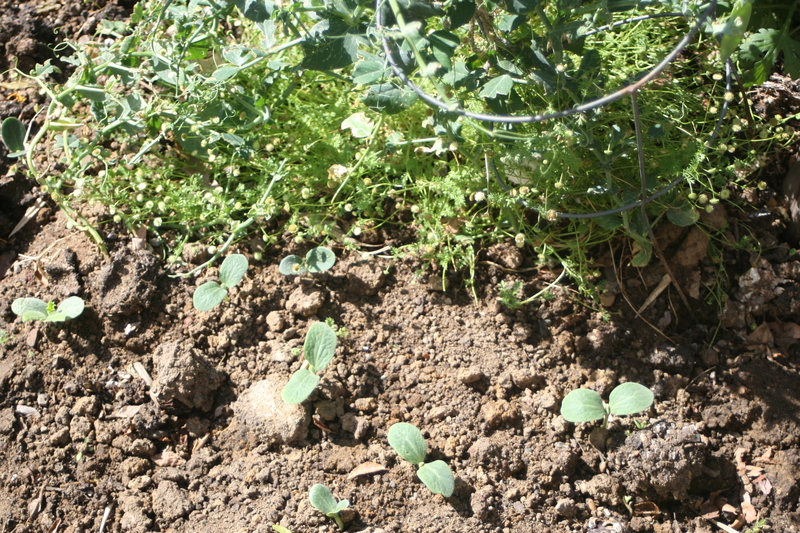 One of the winter squash seeds I planted, this is the first year from seed for my neighborhood, is poking up through the soil. I feel like the farmer that goes out to pull the corns ears to make them grow faster, but for me, the Urban Front Yard Garden Farmer, “it’s making sure the plants are alive, showing signs of growing and feeling the responsibility of feeding others.” The neighbors are asking questions, seeds they muse, obviously doubting, so it’s important to me that it not fail. 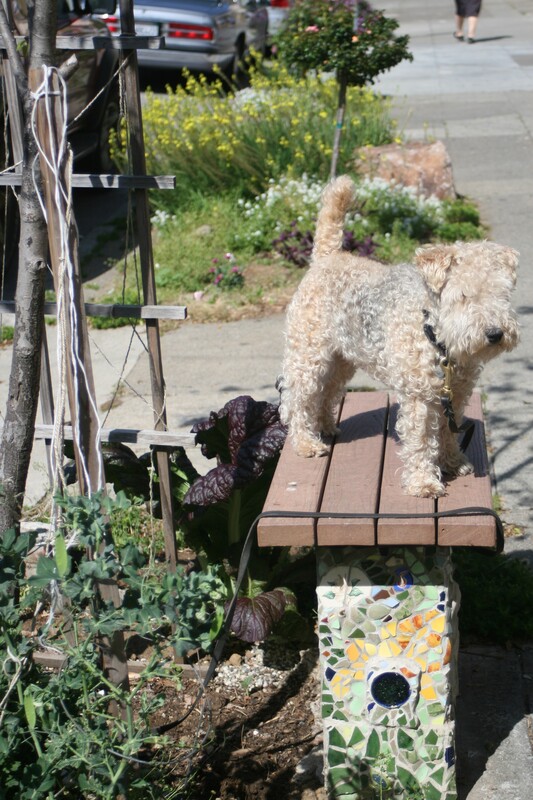 That is the question, “what food plant to plant on the street in the front yard garden?” I put a lot of thought into this question every year. Here are the particulars, what will stay contained and be rather neat, with little upkeep and little water? Very important if you want your garden to be minimal work, and I do. What food is recognizable to my neighbors? This is probably the most important question to me. If I am wrong and I have been, food does not get eaten or picked. That is the worst, plain old waste. I know the worms eat it and the birds, but I plant for humans, and it is a drag when the food doesn’t get eaten. There is not only waste, but somehow the garden stays less neat and clean of debris. What’s the weather looking like for this fall? I guessed wrong this summer, I planted tomatoes, but the regular warm days came late to San Francisco, and the cherry tomatoes were small and few. There were still harvesters, but the garden stayed looking a bit bedraggled, because I guessed wrong. Last night, it was so hot I slept with my street side bedroom window open, it was very noisy. 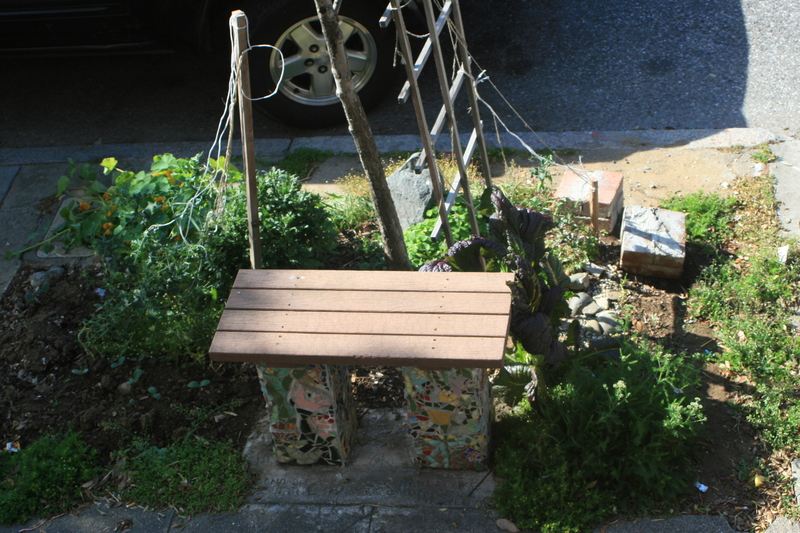 I heard many things, but the thing I remember is someone heaving in front of my house and into the front yard garden. This morning I looked out the window dreading what I might see and there hanging from the string that is attached to the tree, that is holding up the tomatoes, in the front yard garden is the sweet, little, square, hot pink earring, art, gone yesterday, returned today! and the heave, or compost, covered with dirt. That’s a good turn. The sweet, little, square, hot pink earring, art, this morning is gone, but the tomatoes still stand, the flowers are still propped. The older neighbor woman with the shockingly silver, big hair; the neighbor woman across the street told me, she had seen a man doing ‘something’ in the front yard garden. She’d come over later and realized, he’d been gardening in the front yard garden. FABULOUS! we both agreed. This is the community, my neighborhood seeing value in the front yard garden! I cannot tell you how I feel when I think about that. It means more than just niceness. It is about owning something in our hood that is not ours alone. It is about doing something freely for the group; like the ‘litter bug’ did. It’s about doing it for no thing and isn’t that everything. Having someone else garden in the front yard garden, in the soil we all own, makes everything about it worth it for me. 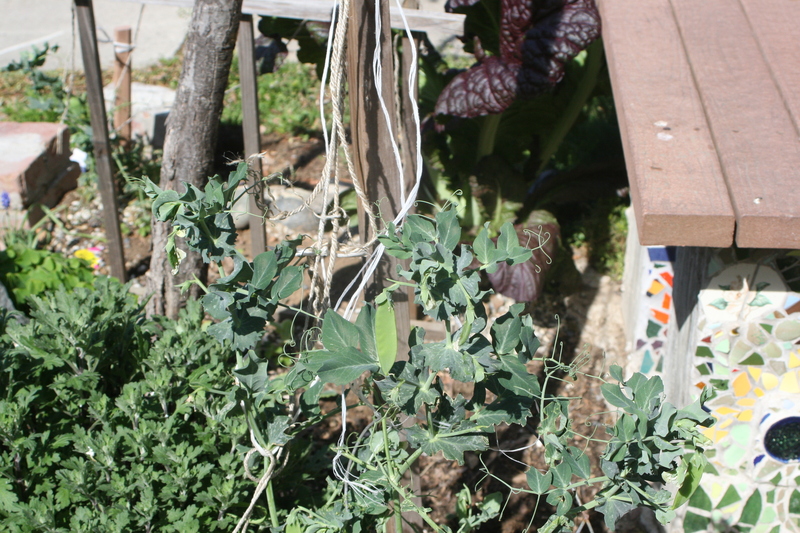 One person, sick of seeing the tomatoes topple, gets up in the morning, stands things tall, with what is right there in the plot and a good turn is done for the garden and the neighborhood.